When talking about paper for a project, we're often asked, "Do you stock that?" The answer is, "Well, it depends—if you're looking for one of our quality house stocks in coated gloss, coated satin or uncoated—the answer is yes!" We keep over 100 skids of our most commonly used house stocks on hand: coated gloss, coated satin and uncoated papers. We try to keep enough to cover our needs for the upcoming three to five days. This allows the paper to become acclimated to our climate controlled environment. Typically, we don't stock brands, varieties and weights other than these house papers. There are a number of benefits to choosing our house stock, namely both cost savings and the ability to produce your project on a tight turn-around. We fully recognize, however, that our house stock paper options may not be suitable for every one of your projects. In those situations, no problem! We'll just order the stock you want. You see, we don't stock much in terms of other paper or envelopes because of the huge variety of options. We leave that up to our paper merchant partners. Think of a paper "merchant" as a car dealership: they distribute paper and provide service locally. These include CMP, Veritiv and Lindenmyer Munroe in our area. Paper mills manufacture the paper. To continue our metaphor, the mills are similar to auto makers such as Ford, GM, BMW, etc. Some of the more common brands associated with paper mills are Sappi, Neenah, Mohawk, French Paper, etc. If isolating just one type of paper — for example, our house satin coated sheet — there are many, many different sizes and weights available, from 60 lb. text through 130 lb. cover and beyond. These papers may also be available in sheetfed press-specific sizes such as 18" x 12", 24" x 36", 25" x 38", 26" x 40" and more. We choose the size that is most optimum (economically) for the press layout for your project. This is an example for just one type of paper. The same options apply for gloss, dull, uncoated, textured, colors, in short, whatever paper you specify. As you can see, it would take lots of space and capital to stock all of these papers, which is why we rely on paper merchants. 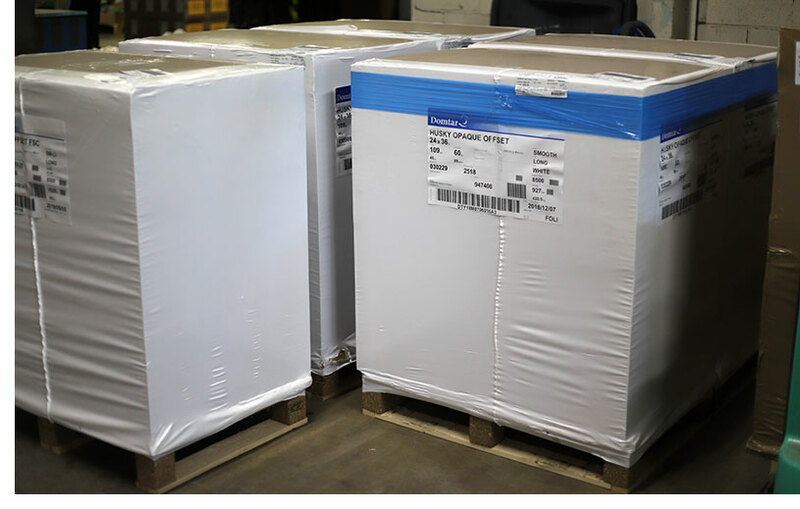 We can generally get many common brands of paper the next day in the sheet size we need and the weight you specify. When an unusual/exotic/textured type of paper is needed, it's a good idea to ask about timing, and allow extra time for these papers to arrive. Paper can often be about half of the cost of a print project. It generally takes up more space and is heavier than people realize. The skid of paper in the photograph is approximately the amount of paper needed for an 8-page brochure, at a quantity of a few thousand (which is a relatively small project). This also brings up a point that we deal with on occasion. If a project is ordered, and then cancelled, we often cannot return the paper without paying a hefty re-stocking fee. 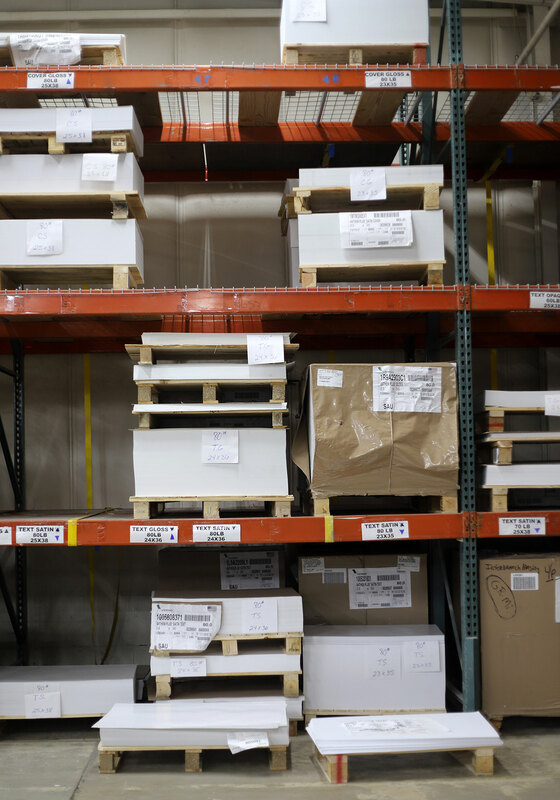 Unlike returning a pair of pants to your favorite retail store, returning already-delivered paper requires a truck, forklift and personnel to move it around. We do keep some small amounts of certain paper on hand for quick and/or digital press projects, but we generally need to order paper for each project. The same applies for envelopes. Your sales rep would be happy to work with you to help you understand and select the right paper for your project.